Stagnate price action until January 26th? Bitcoin is hugging the bottom of the Ichimoku cloud. Another range contraction and consolidation move? Downside pressure again? When we take a look at the Ichimoku Kinko Hyo system, we get a very clear image of what the market is doing and what it may do (only if you’re familiar with the system! Otherwise is looks daunting and confusing). One of the normal behaviors of any chart and any instrument with the Ichimoku System is what happens when price is near the bottom or top of the cloud. 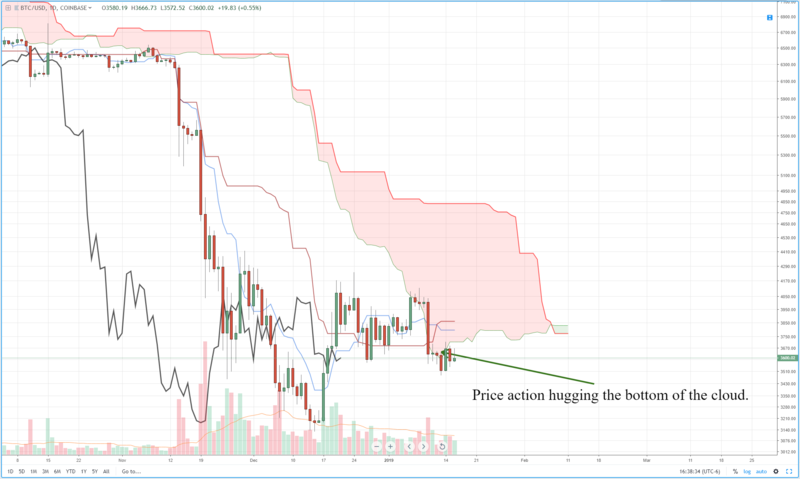 The represents powerful support and resistance levels and when price approaches the cloud (Senkou Span A and Senkou Span B), we often see firm rejection away from the cloud – especially if it is thick. For whatever reason, that behavior has not occurred on Bitcoin’s daily Ichimoku chart. Instead, price has spent the past eleven trading days basically ‘hugging’ the bottom of the cloud and following it through all of its ebbs and flows. If we do a real broad review of the behavior of Bitcoin ever since April of 2018, we see a fairly standard and simple ‘rinse and repeat’ pattern. Almost every single daily candlestick that shows a deep driver lower or a steep drive higher is completed for a very, very short period of time, typically under 1-hour. We’ve discussed this volume behavior before and it is well recorded by many other analysts and news outlets. What happens after those big moves up or down are equally repetitive in its nature. After those big moves, we see tighter and tighter consolidation on all time frames, until we ultimately observe a continued move in the direction of the trend, which is lower. From a trading perspective, the hourly time frames have ceased being a time frame that is worth looking at for any meaningful long or short trading, especially on the Ichimoku System. Because the Ichimoku System is a trend trading system, it is of almost no use on certain timeframes for cryptocurrencies. The moves up or down are simply to fast and not sustained to give even the most vigilant day trader the ability to catch a ride on the trend. These spikes higher and lower fizzle out quicker than they started. Until we see a good amount of follow-through buying and selling from the retail side, most of the participants are going to have to adjust to charts that avoid the use of time: Renko charts, Kagi charts, Point & Figure charts, Line Break Charts, etc. From a Gann cycle based analysis, we could be a further two-weeks from seeing any meaningful movement higher. Not shown on the chart above is the current position of price in the Law of Vibration time cycle. There is a veritable open space of ‘nothing’ in price and time to provide any catalyst of price action in any direction – when that does happen, it is not uncommon to see prices stagnate and trade flat. The 26th of January is where would see some of the beginnings of price action making bigger moves.